In our 2nd day in Puerto Del Sol, we went around the town to explore more of other exciting places in the area. We rented a van of the resort which took us into other key activities in Bolinao, Pangasinan. 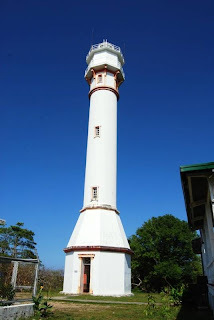 Our first stop was in Cape Bolinao Lighthouse. It is a 300-feet structure built in 1903 by the Americans to guide passers-by of the cape. We also went to a place called White Beach. It is more of a public beach resort for those who go to the town just for the day. Cabanas, benches and tables were there for rent but no beds nor rooms. There are nearby resorts however. Almost beside the White Beach are rock formations which are lovely. Our last swimming stop was in the Enchanted Cave, and underground coral cave with freshwater where you can dip and cool yourself. Going in the Enchanted Cave you will need to climb down a number of steps to reach the water. After climbing down the steepy steps, we were awed by the beauty and coolness of the water. We took a dip and swa for a few minutes. It was a bit dark though and artificial lighting from bulbs and fluorescent lamps were necessary to lighten up the underground water. Sunset, instead of going back to the hotel for dinner, we went to El Pescador Restaurant which is by the sea coastline. Sunset in Bolinao town proper.